Response: Around 64 million Americans live in states that have legalized recreational marijuana. Many policymakers are trying to figure out what that means for traffic safety. On April 20th, some Americans participate in an annual “4/20” counterculture holiday that celebrates and promotes the use of cannabis. 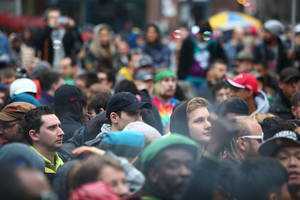 Some 4/20 events such as those in Denver and San Francisco involve thousands of participants. Much like celebrations at midnight on New Year’s eve, public 4/20 events sometimes mark 4:20 p.m. by a countdown followed by synchronized mass consumption of cannabis. We thought this was a perfect natural experiment to evaluate the influence that cannabis intoxication has on the risk of motor vehicle crash. To examine this question, we analyzed 25 years of data on all fatal traffic crashes in the United States. We compared the number of drivers in crashes between 4:20 p.m. and midnight on April 20th to the number of drivers in crashes during the same time interval on control days one week earlier and one week later. We found that the risk of crash involvement was 12% higher on April 20th than on control days. In the subgroups of drivers younger than 21 years of age, the risk of crash involvement was 38% higher on April 20th than on control days. Assuming fewer than 12% of Americans celebrate 4/20, our results suggest that substance use at April 20th celebrations more than doubles the risk of fatal crash. Response: The take-away for the public is: Don’t drive high. Impairment with alcohol and drugs increases the risk of crash. The take-away for clinicians is: Talk to your patients about impaired driving, particularly when drug and alcohol use comes up in a clinical encounter. The take-away for 4/20 event organizers is: Help 4/20 participants arrive home alive by making safer transportation a part of the festival plan. The take-away for policymakers is: Traffic injuries are a preventable disease. Thoughtful policy choices can prevent traffic injuries and death. Response: There is a need for research to help us better understand how we can reduce the number of people driving while impaired by alcohol and drugs. Response: Improving road safety requires both policymakers and drivers to make smart decisions. If you’re going to get behind the wheel, buckle up, put the phone away, don’t speed, stay sober and don’t drive high. This entry was posted in Accidents & Violence, Author Interviews, Cannabis, JAMA and tagged cannabis, car accidents, marijuana by Marie Benz MD FAAD. Bookmark the permalink.